Freshman center No. 21 Daelyn Bams throwing down the two handed slam over one of the Pasadena City College players. 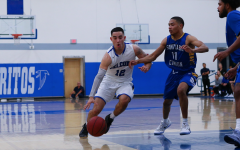 Bams had 13 points and six rebounds in the game against Pasadena City College at Cerritos College on Jan. 18, 2019. 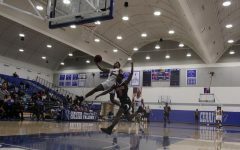 Falcons men’s basketball’s 72-68 home loss to Pasadena City College on Friday had a controversial end to it. With the loss the team is now 13-5 and has dropped three of its last four games. The controversy was mainly referee inflicted, due to several non-calls and miscues. 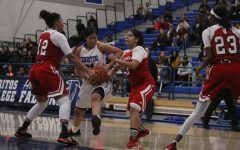 Cerritos College had possession of the ball, up two, with 25 seconds remaining, according to head coach Russ May Pasadena City College was trying to intentionally foul to put the Falcons at the line in order to get the ball back. However, the refs called it a turnover. That non call led to an And-1 putback for PCC’s Jordan Simpson, No. 20 which put the team up three. On the Falcons’ next play, PCC’s No. 4 Giovonni Jackson stole the ball and was immediately fouled, he missed the first free throw and the game clock had ran out. However, after complaints from May, the refs conferred and realized they made a mistake, put three seconds back on the clock and placed Jackson back at the free throw line, he made it and the game was over for the second and final time. Ultimately, the game ended strikingly similar to last year’s Final Four loss. The team was up by one with an opposing player shooting free throws, the player missed, then the Falcons fouled on a put back after an offensive rebound, putting the opposing team back on the line—and like in both games, the rest is history. Daelyn Bams, freshman center, No. 21 tallied a season high 13 points—which he scored all in the first half. He also collected six boards for the game. Also like the Final Four matchup against San Francisco City College, the Falcons had the chance to extend the one point lead at the free throw line but did not capitalize on the opportunities. Sophomore guard Christian Alvis-Labaddie could have put Cerritos College up four at the free throw line with 35 seconds remaining. He missed the mark on the first shot of a one and one—you have to make the first shot of those type of free throw attempts in order to shoot the second. Later, sophomore guard Tawon Elston missed the go-ahead free throw attempt, which would have tied it with 8.1 seconds left in the game. After sinking the first free throw attempt of two, Elston said he didn’t do his usual routine on the second and rushed it, which may have caused the miss. “I gotta step up in those moments,” he stated. Elston led the team with 14 points off the bench. He also filled the box score with four rebounds and three assists. 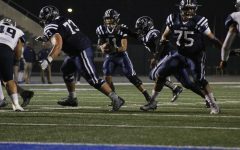 Cerritos College clinged on to a two-point advantage with just over a minute left in the final half like a toddler to someone’s finger. The Falcons would maintain that two-point lead all the way until the final 22 seconds of the game. Then the team watched as their beloved lead dwindled point by point over the course of the final seconds, until it was just a recent memory. Cerritos College was out scored 9-1 by Pasadena City College over the final two minutes and 46 seconds. It was a back and forth contest, with eight ties and eight lead changes. The Falcons led for the majority of the 40 minutes, after coming back from a 10-2 deficit in the first three minutes of gameplay. Following a record breaking 102-50 blowout win at Rio Hondo College on Jan. 11, the Falcons then laid an egg losing by 15 at Los Angeles Trade Tech College, 98-73. Freshman guard Chance Hunter, No. 13 talked about the difference between getting beat by 15 and losing a close game like Friday’s match. In the loss to LA Trade Tech, Hunter put up 27 points and 13 rebounds, both season highs. However, he struggled shooting the ball versus PCC and finished with 13 points and six rebounds, on 6–17 from the field. Hunter attributed the poor shooting to forcing shots in the offense. Shooting from 3-point range was also an Achilles hill for the Falcons. The team shot an ice cold 17.6 percent from 3, while PCC connected on 42.9 percent of its triples. 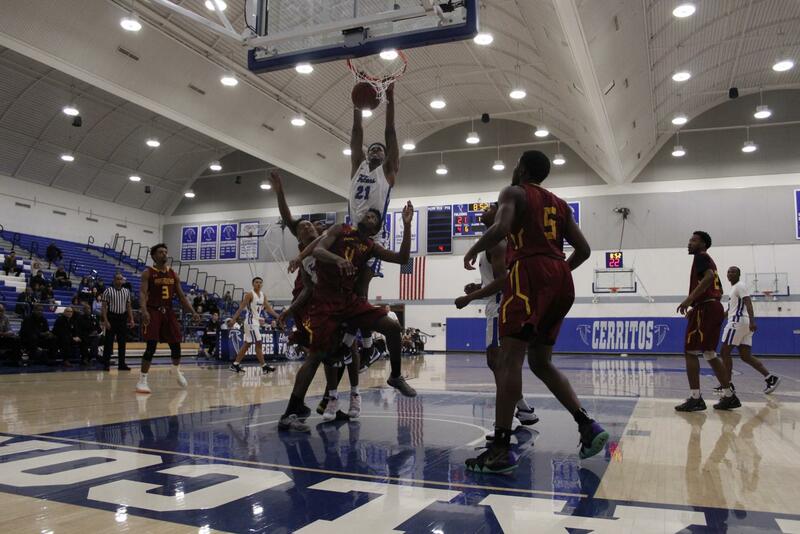 Cerritos College men’s hoops will take on rivals Long Beach City College on Jan. 23 at 5 p.m. in an away game. After the matchup at LBCC, the team will come back home to face El Camino College on Jan. 25 at 5 p.m.